During the Dan Meyer talk he focused mainly on problem “perplexity” and how to engage students through these types of questions. He first mentioned two facts he learned during his years of teaching. Then he went on to make some analogies regarding math and real life. He then tried to lay out a model to follow in order to create these perplexing lessons. He then modeled a more specific problem that would perplex the students using these steps. Finally he walked us through how a lesson would work with one of these questions. Ah! How to describe ED526B to future students and professors? I would have to say that it has been one of the most challenging and fulfilling online courses I have taken. The amount of work that was expected during the first half of the course made me very happy to be teaching only two classes of summer school. I definitely would have struggled to complete the work if I had a full time work commitment as well. With that said, I think the measures taken to have us become more technologically adept were well worth the effort. I can definitely see myself working more technology into my teaching based on the tools we learned in this class. I would have to say that the highlight of this course for me has been the interaction with the mathematical community at large. I was able to see that there are people out there that love math just as much ( if not more than ) I do. I also learned that I do not have nearly enough hours in the day to become as involved as I would like to in this community. I barely have enough time to feed myself and get a shower during the day I have so much going on already. I look forward to the challenge of finding time in my schedule to continue learning through the live events. Thank you Maria for opening my eyes to a whole new world in which to explore mathematics. I attended the Live event, Classroom 2.0 live: VolunteerSpot, we learned about a free website that is dedicated to solving the problem of organizing parent volunteering at schools. VolunteerSpot allows teachers to set up an interactive calendar where parents can sign up for different volunteer opportunities. This website allows you to set up different needs for different days and you can specify what is needed to be brought and what is needed to be done. I can see myself using this website to help me keep my National Honor Society students’ service opportunities organized. Students can sign up for activities and I can keep track of their service hours for their requirements. In the Live event Expert ways of seeing: Transforming novices through visual learning, we learned of a new way that Bruce Kirchoff is proposing of teaching Mathematics. He likens the teaching of math to ways that his students learn to identify plants. He suggests a holistic approach that focuses on the visual identification of mathematical ideas. He feels that repetition is the key and he stresses little focus on traditional keys in his students learning. Kirchoff promotes working at a mastery level so that students can learn to identify the basics necessary while focusing on the bigger picture. This harkens back to the piece we watched by Dan Meyer earlier in the course. I thought Mr. Kirchoff’s presentation was excellent. He was by far the most prepared and well versed speaker I have seen at a live event this summer. His ideas were made very clearly and I truly wished he had cut the question/ discussion sections shorter and gotten to more of the prepared content. 1) Apparently you have either not seen the textbooks used in NY or PA for teaching algebra 1, or you have a different definition of rote instruction than I do. the text books I have been using for the last 7 years in those two states offer very little other than rote instruction. to the point that the practice questions actually refer back to the “instruction” given a few pages earlier. Usually, the instruction only consists of an example and how it is to be solved. 2)I disagree with your contention that he is implying that math teachers do not know math. He is simply stating that when a person has learned a topic one way it takes a lot of creativity and intelligence to try to teach it in a different way. When we, as teachers, are concocting our lessons it is only natural to fall back on the methods used to impart that same knowledge to us. Since most of us were taught in “traditional” settings it would only make sense that we would harken back to those same tools and methods when we are trying to duplicate the process for our students. 3) The question here is not whether traditional teaching methods work for a select few students. But rather, what will work for the greater majority. Working in low SES, underperforming schools for seven years has shown me that these students do not respond well to the way we are currently teaching math in this country. By the time my students get to me (9th grade algebra) they are already disillusioned with the study of math. I can not tell you haw many times I have had a student ask me, “When will I ever use this in real life?” In order to combat this disheartening attitude I have tried to enrich my teaching with problem based, real life scenarios. While I have not been completely successful in reaching a majority of my students, I have seen great strides in some of them. 1) Create a rap, based on a current popular song, that informs students of the relationship between the slope and y-intercept and what a graph looks like. 2) Using Geogebra, geometer’s sketchpad, or graphs (MacBook), create an applet that others can use to discover the relationship between the slope of a line and it’s equation. 3) Students will search the Web for at least 5 definitions of slope and y- intercept. They will then rank these definitions in order from best to worst, creating a poster for each term. Remembering and applying – list all of the possibilities of rolling one die then list all of the possibilities of rolling two dice. Assessment- #1) Check for completion #2) Journal entry having the students write an explanation of WHY they listed what they listed. Understanding and analyzing- compare the two lists, answer the following questions about the lists. 1) Why is the second list so much longer than the first if we only added one more die? 2) What does this say about the possibility of getting a total of 3 in each case? What about getting a 6? Assessment – #1) Have students compare and contrast the two sample spaces. #2) have the students create a powerpoint or keynote presentation outlining the differences between the two sample spaces. Evaluating – perform an experiment. Roll a single die 50 times and record your results. then roll a pair of dice 50 times and record your results. Check your experimental probabilities against your theoretical ones. what did you find? What do you think would happen if you did each experiment 100 times? 1000 times? 1,000,000 times? Assessment – #1) Peer assessment. students will compare their thoughts with a classmate’s and come together on a consensus. #2) Formative. students will use whiteboards to answer questions by the teacher that reflect the task at hand. As students hold up their answers the teacher can see where students thinking might need some redirection. Creating – design another experiment involving probability using things you see in your everyday life. Find the theoretical probabilities and then carry out an experiment using the materials you describe. compare your results with your hypothesis (theoretical probabilities). 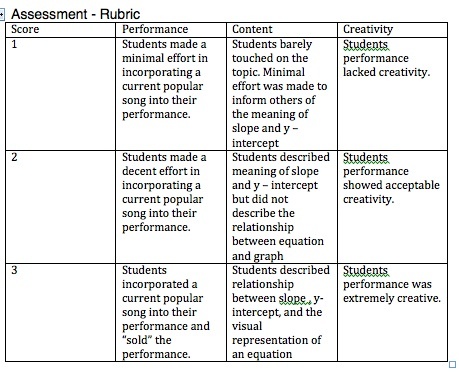 Assessment – #1) A rubric that clearly delineates the objectives for this assignment. This way the students can self assess as they work through the experiment. #2) Peer assessment. have students “trade” experiments. Students will then evaluate their classmates work and give it a grade from 1 – 10.